When the Republic of Latvia began to operate a postal service in December 1918, very primitive methods were sometimes used in order to achieve a regular service. Some equipment that had been left behind by the Imperial Russian postal service as well as by the German postal service during the territory of the "Supreme Commander, East" had also been used (in its original and amended form) by the service of the Republic of Latvia 1919 - 20. In regard to postmarks, most of these did not represent the young nation state, although some of them had their inscription altered. 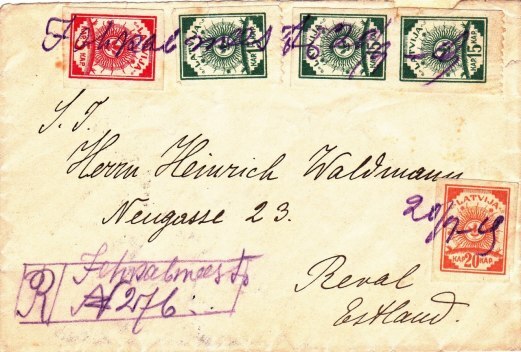 Due to the wartime situation many of the postmarks were no longer available, and so the management of local post offices had hastily organized their replacement. This explains the many varieties of the so-called provisional hand stamps, or the manuscript cancellations. Despite the wide variety of these, it is possible to recognize several different groups of the provisional cancellations. I have in my listings divided those into 15 different types, pr 1 - pr15, which is some more than in the von Hofmann Handbook. During this period also censoring of mail took place at some post offices in the Latvian territory. Censorship marking ar known from the Soviet-Latvian Republic time as well as during the Latvian Republic time.